Ibiza Rocks is bringing the heat of the Balearics back to the Alps this Winter as part of RISE Festival. Hosts of the outdoor Ibiza Rocks Main Stage and indoor W.A.R! Arena, Ibiza Rocks will welcome a collection of live acts and DJs including D&B duo Sigma who will bring their full live band to headline the main stage on Sunday 13 December. 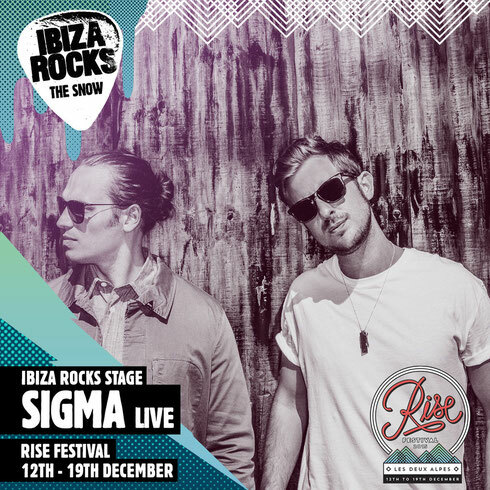 Following their live sets at Ibiza Rocks this summer which included tracks ‘Bound 2’, ‘Changing’ and ‘Higher’, Sigma are excited to be snowbound saying: “Ibiza Rocks was one of the highlights of an amazing summer, and we can't wait to bring that vibe to our LIVE performance at Rise Festival." After summers spent on the W.A.R! stage in Ibiza, club partners and friends of the brand Eton Messy, Hospitality and Rinse FM will make their mark on the snow with takeovers at the W.A.R! Arena. As well as the Ibiza Rocks Main Stage and W.A.R! Arena, Ibiza Rocks will provide the soundtrack to bespoke events throughout the week-long festival including an après ski W.A.R! party in the stunning setting of the mountain top Pano Bar and a SHELTER takeover at Les Deux Alps top late-night spot L’Avalanche.